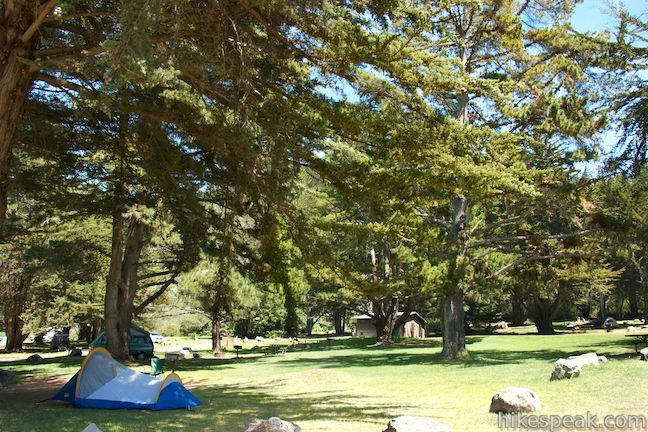 Plaskett Creek Campground is a convenient place for tent or RV camping in Big Sur. 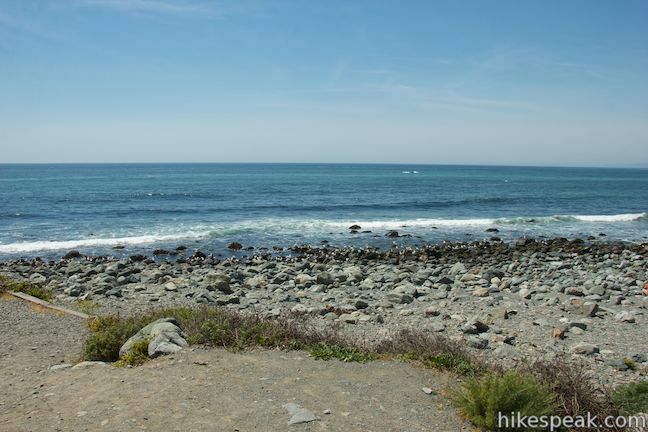 The campground is close enough to the coast for visitors to smell the ocean, and there are several short hikes nearby. 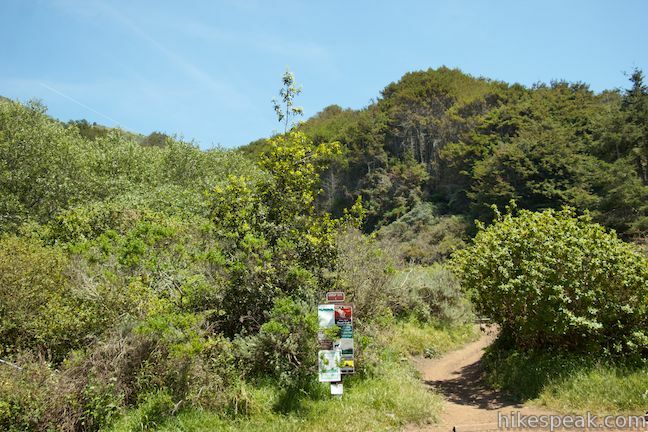 Trails to Sand Dollar Beach, Jade Cove and Plaskett Rock Point are just across Highway One from the campground and Pacific Valley Bluff Trail is only a mile to the north. 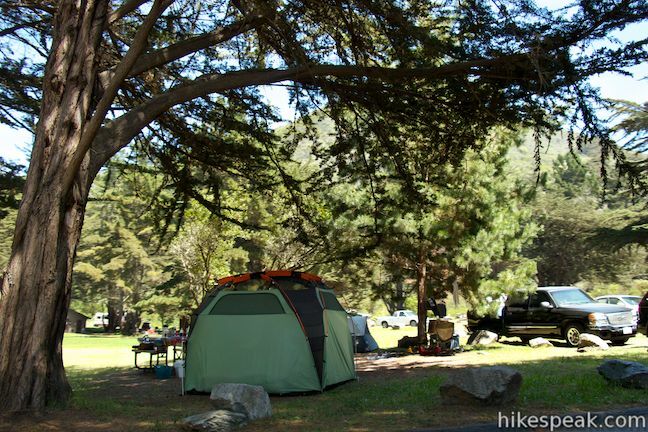 This Los Padres National Forest Campground is surrounded by undeveloped mountains and waterfront for a coastal camping experience that’s a long way from any city. 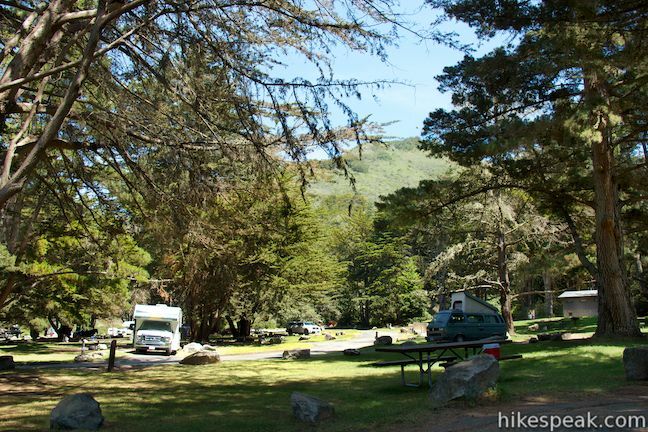 With lots to do in the immediate area, Plaskett Creek Campground is a solid place to stay while exploring Big Sur. 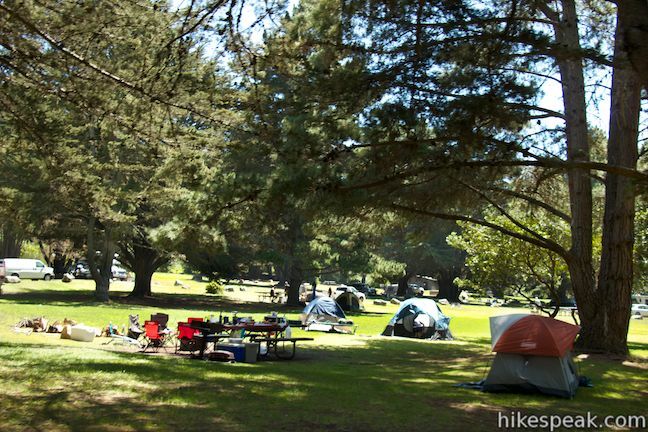 Plaskett Creek Campground lies on the lowest slopes of the Santa Lucia Mountains, just across Highway One from ocean bluffs. 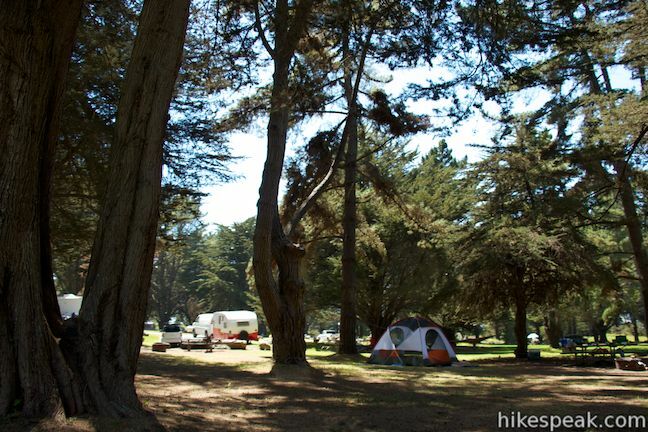 The campground is spread out across a grassy field with lots of big openings for sunlight between tall cedars and Monterey pines. 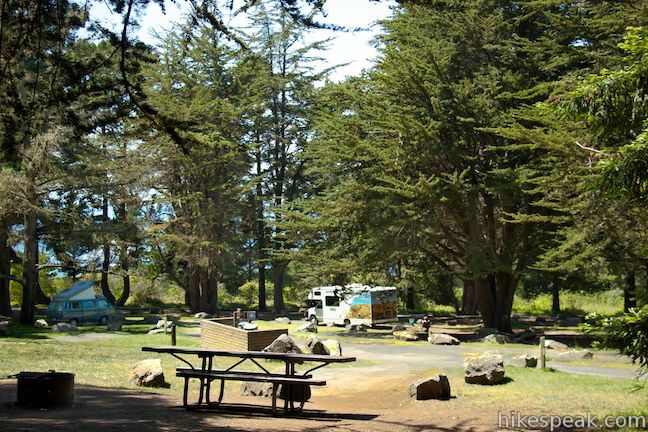 Despite its proximity to the coast, ocean views aren’t ubiquitous within the campground (like they are at nearby Kirk Creek Campground), but you can see slices of the Pacific between the trees from certain sites. Plaskett Creek Campground has 42 standard non-powered sites for tents and RVs for parties of up to 8 people. Three group sites handle larger gatherings of up to 40 campers. 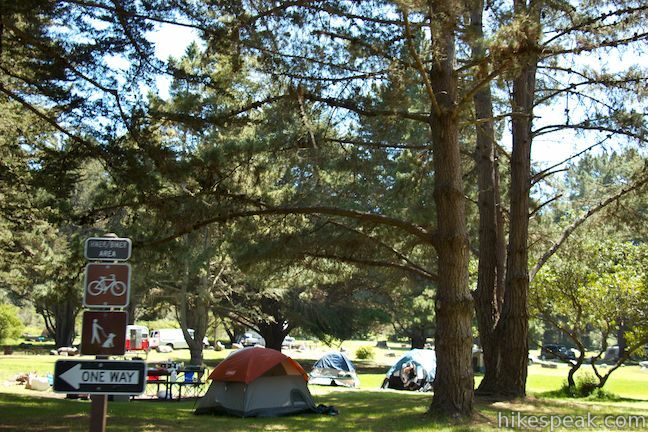 Additionally, a hiker and biker camping area accommodates those who don’t have a vehicle to park. 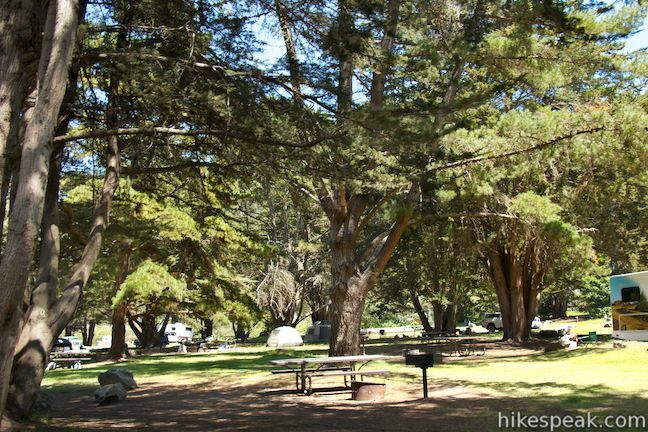 Each standard campsite comes with a picnic table, a fire ring, and a barbecue grill. The campground has flush toilets, sinks, and drinking water. There are additional vault toilets for the group sites. 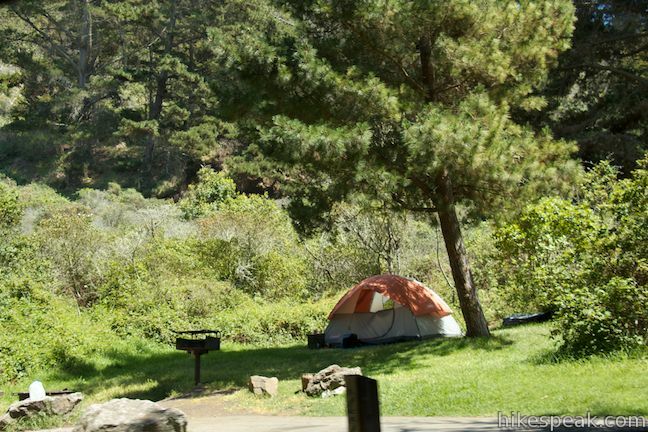 Campsites may be reserved in advance on recreation.gov or by calling Parks Management Company, the operators of the campground, at (805) 434-1996. 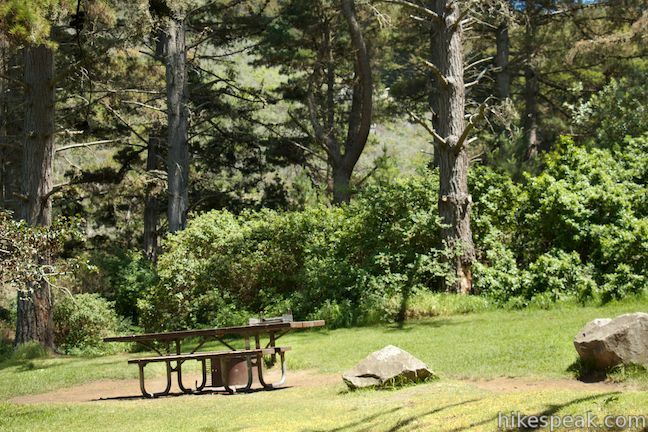 Reservations will be key on summer weekends when Big Sur campgrounds fill up in advance. 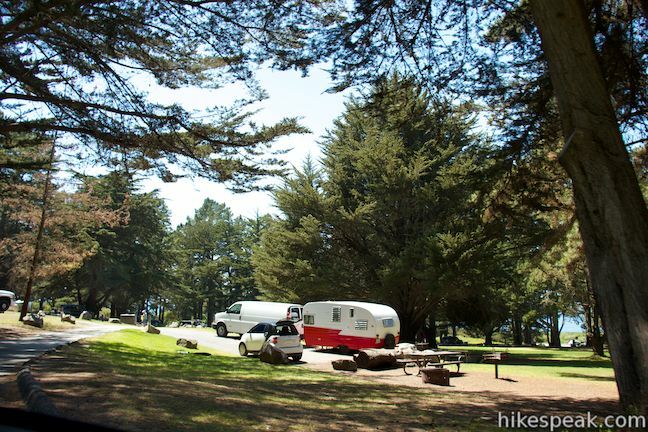 There is a $35 fee for each campsite that covers one vehicle. 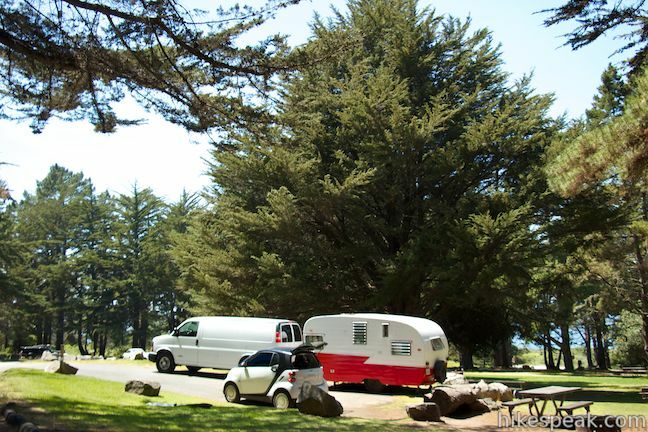 A second vehicle can be added to a campsite for an additional $10. Each group site can be booked for $100 per night. The charge for the hiker/biker area is $5 per person per night. The maximum length of time that you can stay at any site is 14 days. Generators are allowed during the day from 9 a.m. to 9 p.m. Dogs are allowed in the campground on leashes. Check in and check out time is 2 p.m. 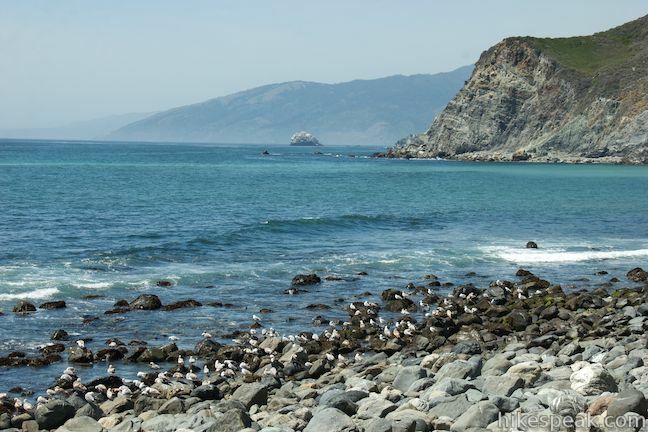 When you pay to camp at Plaskett Creek Campground, you can access nearby beaches in Los Padres National Forest without paying additional day use fees. There is no need to pay the usual $10 entrance fee for Sand Dollar Beach or Pfieffer Beach if you have a camping permit (all prices as of 2018). 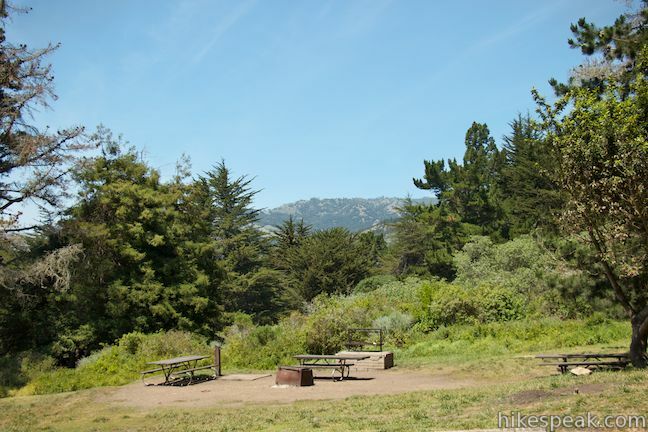 In addition to the nearby hiking trails, you may also wish to check out Willow Creek Picnic Area (photos below), which is located along Highway One, 2 miles south of Plaskett Creek Campground. A paved road drops from Highway One into a canyon at the end of Willow Creek, passing below the highway. The short road ends at a rocky beach where there is some parking, a toilet, and boulders to sit on to have a picnic. You can look up and down the coast from the cove at the bottom of the creek. 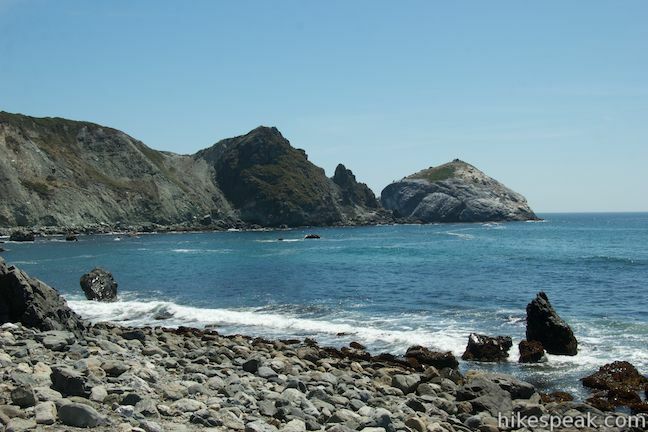 The view of Cape San Martin and the small island called San Martin Rock just to the south is worth the drive down. 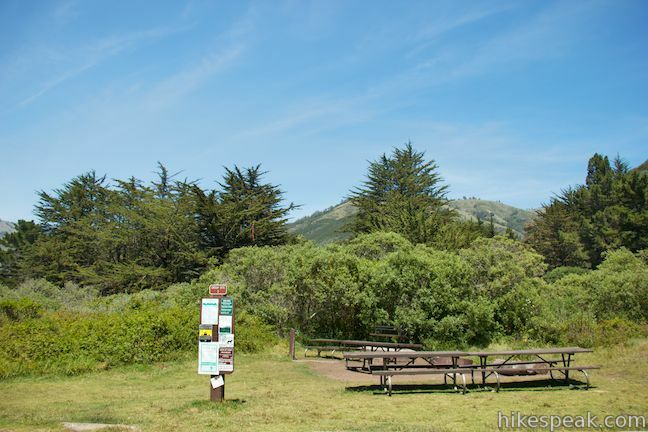 To get to the campground: From the south, drive up Highway One to the campground entrance on the east side of the road, 15 miles north of Ragged Point Inn (or 38.5 miles north of Cambria). 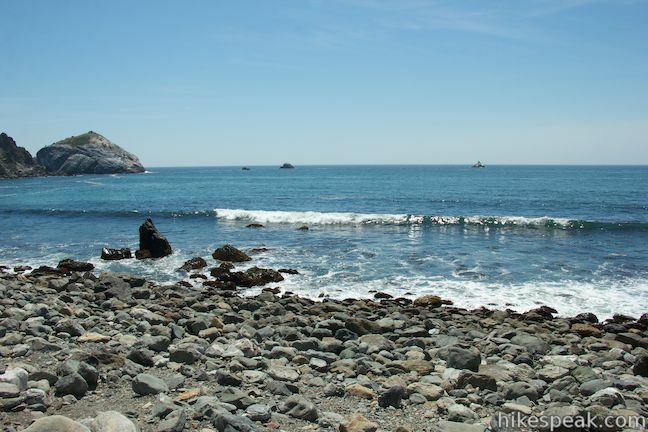 From the north, drive 21.5 miles south from Julia Pfeiffer Burns State Park (home of McWay Falls) to Plaskett Creek Campground, which is just south of the Sand Dollar Beach Day Use Area. 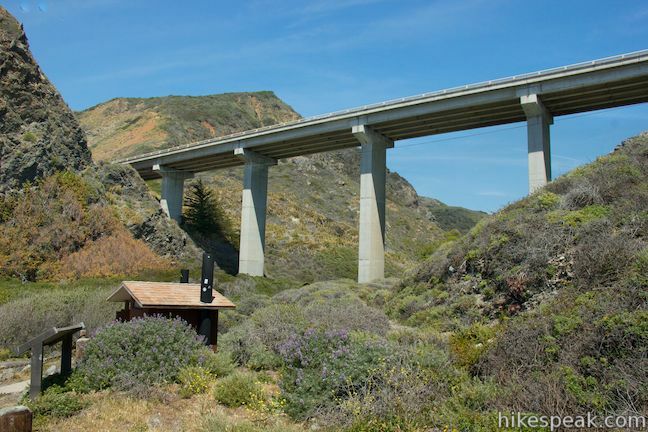 This short hike to Big Sur’s longest beach passes two scenic overlooks on the way to the sand for a hike of 0.5 miles (or more) round trip. 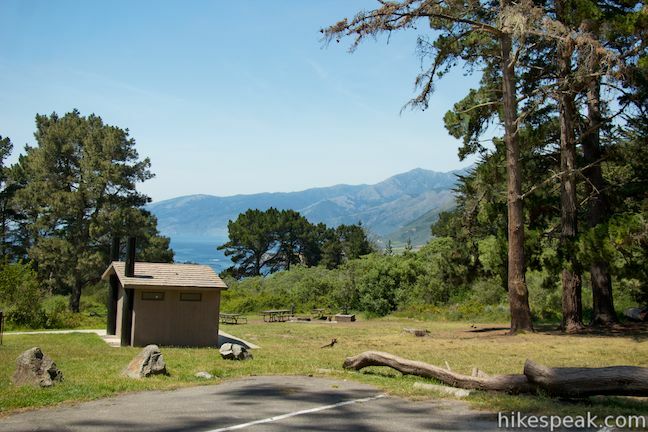 This hike of 6.5 miles or more reaches incredibly ocean vistas and trail camps in the Silver Peak Wilderness. Connect Cruickshank Trail and Buckeye Trail for an excellent shuttle hike of 8.25 miles or more. 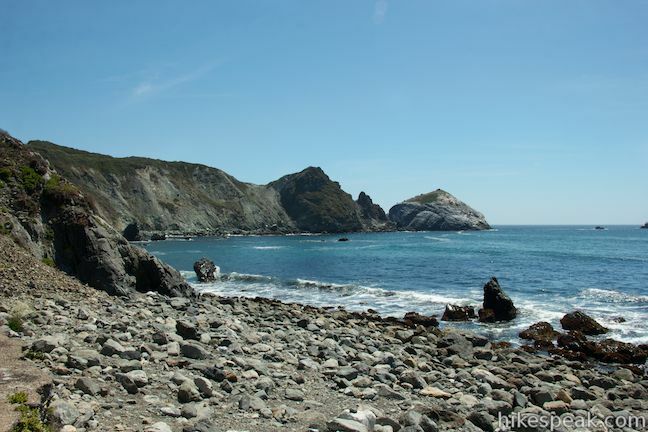 This 1.5 mile hike visits a cove and a secluded beach along the scenic Big Sur coast. The cove is accessed through a tunnel. 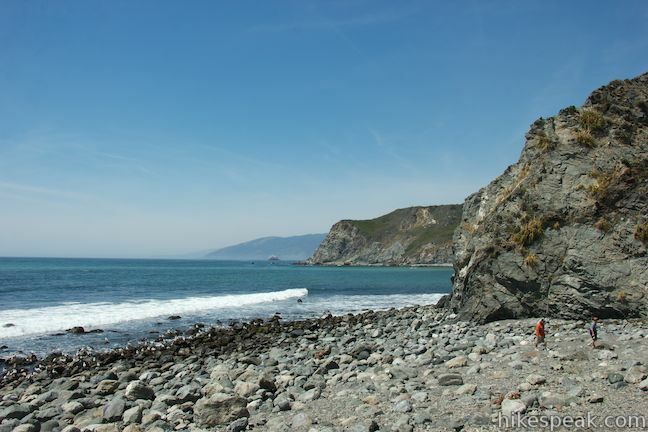 This short walk reaches an absolutely stunning beach that’s a classic feature of the Big Sur landscape. This half-mile off-trail hike ventures up the Big Sur River on a water-wading boulder-hopping adventure to a crystal clear pool that’s a gorgeous Big Sur swimming hole.